The Vampire, His Kith and Kin examined the reasons for the old belief in Vampirism, its growth and dissemination in many lands, and its crystallization into a permanent and determinate legend. 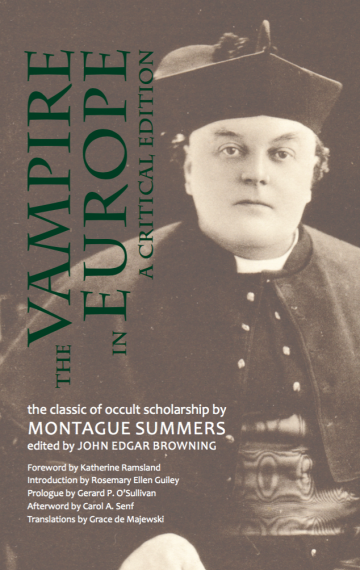 This new volume, The Vampire in Europe, uniform with the other, deals with the subject from a historical point of view and presents the evidence which gave rise to the theories. This evidence, drawn from little-known authors, musty chronicles, and the obscurer occultists, is in many cases derived from official sources, civil and ecclesiastical. The first chapter treats of Vampirism in ancient Greece and Rome. Accounts of the extraordinary outbreaks of Vampirism in England during the twelfth and thirteenth centuries have been gathered from Geoffrey of Monmouth and William of Newburgh. Particular attention is paid to the alleged irritation which gave rise to so much literature in the early eighteenth century, while the curious situation in modern Greece is fully discussed. Included in this critical edition are the authoritative text, rare contextual and source materials, illustrations, criticism, contemporary reviews, and Greek and Latin translations. A biographical note is also included. ABOUT THE EDITOR: John Edgar Browning is a Marion L. Brittain Postdoctoral Fellow at the Georgia Institute of Technology. He is an authority on Dracula, vampires, and horror films and is the co-author or co-editor of twelve other published or forthcoming books, including The Vampire, His Kith and Kin: A Critical Edition and The Forgotten Writings of Bram Stoker.